This is Yundi Li’s fifth release for the prestigious German yellow label; his first concerto recording. From having a hurried listen to this disc in the car my initial reaction of excitement and satisfaction from the playing of Yundi Li hasn’t changed. Only rarely do performances as excellent as these come along that can be ranked alongside those established in the repertoire. Born in 1982 in the People’s Republic of China, Yundi Li won the prestigious 1999 Liszt International Piano Competition in Utrecht and the 2000 Chopin Competition in Warsaw; were he performed Chopin’s E minor concerto. Yundi Li has commented how rare it was to encounter Western classical music in his homeland during his formative years and how he first heard Liszt’s E flat Concerto on 78 rpm records when he was nine and the Chopin E minor Concerto aged fourteen. Growing up with these popular favourites of the Romantic concerto repertoire Yundi Li has been performing both regularly around the world for some years. Liszt made the first sketches for his E flat major Concerto in 1830 and seems to have completed the score around 1849 making revisions in 1853 and more adjustments again in 1856 prior to publication. Dedicated to the piano virtuoso and composer Henry Litolff it would be hard to imagine more eminent performers at its premiere in Weimar in 1855 with the composer as soloist and Hector Berlioz conducting. Liszt biographer Humphrey Searle in 1966 stated that the first concerto, “is not an entirely successful work…” believing that the, “second concerto, is a very much more successful work…”. The E flat major score is divided into four sections. The triangle part in the third movement has been the cause of ridicule by some over the years and influential critic Eduard Hanslick dubbed the score the ‘Triangle Concerto’ a nickname now used with affection rather than sarcasm. Yundi Li does a magnificent job with the contrasting demands of Liszt’s inconsistent genius, with writing that is brilliant one minute and bordering on the vulgar the next. His playing is assured and exciting, blending drama with poetry. The opening section has an emotional searching quality to which Yundi Li gives an apt and natural response. The sheer intensity of his playing at 3:57-4:09 is remarkable, with compelling tenderness at 3:57-4:09, creating an air of mystery that closes the section. Love and romance were clearly dominant in Liszt’s mind in the Quasi adagio section. At 2:20 the composer seems uncertain what direction to take, however, between 3:10-3:41 Yundi Li is assured in the gentle episode of heartfelt beauty. I enjoyed the passages from 3:42 where the playful woodwind perform over a preponderance of piano trills. Fluid and agile playing in the third section becomes significantly assertive from 2:58-3:59. The volume of the famous ‘triangle’ feels just about right. In the final section I was especially impressed by the superb orchestral playing from the Philharmonia under Andrew Davis. Yundi Li is powerful and dramatic at 0:32-0:59 displaying light-hearted playing of a scampering quality from 0:60-3:00 that develops to a hair-raising climax of outstanding virtuosity. Probably the most fêted version of this score is the exhilarating and confident recording from Krystian Zimerman and the Boston Symphony Orchestra under Seiji Ozawa. The recording was made at the Symphony Hall, Boston in 1987 and is available on Deutsche Grammophon 423 571-2 with Liszt Piano Concerto No.2 in A major and Totentanz. I still treasure my 1982 vinyl recording of the Liszt E flat major Concerto from sparkling French soloist Cécile Ousset with the CBSO under Simon Rattle on EMI ASD 4307 (c/w Saint-Saëns Piano Concerto No.2). I understand that this Ousset recording, with the same coupling, has been released on CD on EMI CDC 7 47221 2 but I have not been able to track down a copy. Chopin dedicated the E minor score to his friend the virtuoso pianist and composer Frédéric Kalkbrenner. With Chopin as the soloist the E minor Concerto was premiered as the centre-piece at a ceremonial farewell concert at Warsaw’s National Theatre in 1830. It was only three weeks later that Chopin left his homeland never to return to Polish soil. On account of its earlier publication the E minor score is designated as the Piano Concerto No. 1 even though it was the second of his two concertos to be written. The massive opening movement at over nineteen minutes is virtually equal in length to the other two movements added together. In the extended opening orchestral passage the Philharmonia under Andrew Davis provide high quality support to the dramatic and poetic playing. From the entry of the piano at 4:03 the playing is bold and beautiful catching the feminine quality of Chopin’s fluid and lyrical lines. I found the slight hesitation before crucial notes such as at 4:36; 5:15 and 7:14 cast a wonderful spell. From 10:47 the tender flowing lines return with brilliant passages containing an abundance of arpeggio runs. Yundi Li performs with a crystalline quality displaying a subtle close control. Interviewed for the ‘Promo Video’ to this release on the DG website Yundi Li remarks, “the second movement is the most important in this concerto” and infers strong influences to love and romance. Yundi Li’s performance in the poignant Larghetto has all the intensity of a passionate love letter. At times his poetic and sensitive playing has a gossamer quality. The concerto ends with a fiery and vigorous Rondo movement, a Vivace in the form of a Krakowiak a syncopated Polish dance from the Kraków region. The music gains in vigour and intensity as Yundi Li confidently brings the score home to a heroic conclusion. My reference performance of Chopin’s E minor Concerto is the authoritative and spirited account from Krystian Zimerman with Carlo Maria Giulini conducting the Los Angeles Philharmonic Orchestra. The recording made in 1978 at the Los Angeles Music Center is on Deutsche Grammophon 415 970-2 (c/w Chopin Piano Concerto No.2). The booklet notes that accompany this release are interesting and reasonably informative. I have read some criticism of the quality of the sonics, a view with which I do not agree. The sound quality seems characteristic of the yellow label, somewhat dry but generally commendably clear. I found the playing crystal clear with the orchestra slightly losing focus only in the peak forte passages.. At only fifty-six minutes the playing time is ungenerous. There is certainly room to have accommodated another substantial work, such as Liszt’s Totentanz; Concerto pathéthique or Chopin’s Andante spianato et Grande polonaise brillante or the Variations on 'La ci darem la mano'. Yundi Li excites and delights with these Liszt and Chopin warhorses. He proves to be a performer of significant stature. A remarkable concerto recording debut. 1) Yundi Li - Chopin Piano Works: Piano Sonata No. 3 in B minor; Andante spianato and Grande Polonaise in E flat, Op. 22; Etudes 2 & 5, Op. 10; Etude 11, Op. 25; Nocturnes No. 1 & 2, Op. 9 & Nocturne No. 2, Op. 15 and Impromptu No.4 in C sharp minor, Op.66 ‘Fantaisie-Impromptu’. Recorded in 2001 on Deutsche Grammophon 471 479-2. 2) Yundi Li performs Liszt: Piano Sonata in B minor, S.178; Liebestraum No.3; Widmung after Schumann: Liebeslied; Tarantella from Venezia e Napoli; Rigoletto-Paraphrase and La Campanella. Recorded in 2002 on Deutsche Grammophon CD 471 585-2 & SACD 474 297-2. 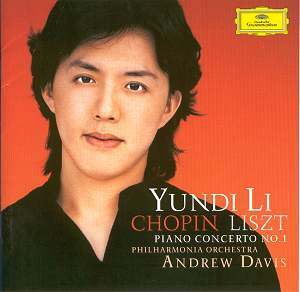 3) Yundi Li - Chopin Scherzi: Scherzi 1-4 and Impromptus Nos. 1-3. Recorded 2004 on Deutsche Grammophon CD 474 516-2 & SACD 474 878-2. 4) Yundi Li - Vienna Recital: Domenico Scarlatti Sonata No. 6, Kk 380: L 23 andante comodo & Sonata in G, Kk.13; Mozart Piano Sonata No..10 in C major, K.330; Schumann Carnaval, Op.9 and Liszt Rhapsodie espagnole, S. 254. Recorded 2005 at the Musikverein, Vienna on Deutsche Grammophon CD 477 557-1.